In stock! U.S. domestic and international orders welcome. European customers: Click here for WEEE and RoHS compliance information. AudioRail customers looking for ADT1616 interface cards for the DDX3216? We have a few available. Click here. Compatibility issue with the PreSonus DigiMax FS and JetPLL: Click here. This website is committed to delivering straightforward information with no marketing hype. All correspondence should be directed to info@audiorail.com or telephone inquiries to (978) 461-0177. Info: Use Cat5 to fiber converters to extend AudioRail's reach. AudioRail® is a simple and elegant, patented method for transporting many channels of digital audio over a daisy chain of standard Category 5 UTP (Unshielded Twisted Pair) cable or other LAN interconnect media using off the shelf Ethernet transceiver technology, forming a digital audio snake. No software, firmware, DSP, or any kind of microprocessor intelligence is employed in the entire network audio mechanism. The digital audio transport latency is on the order of a few microseconds, end to end, which makes it essentially negligible, and ideally applicable for live sound applications. more on latency The system is simple and straightforward, requiring no software or computer control to transport the many digital audio channels from end to end. The system comes up and becomes completely functional within about two seconds after power is applied. The system configuration is versatile, as any number of modular units can be daisy chained together. Each individual incoming audio port in the configuration can be routed in either direction and each outgoing audio port can be switched to tap off of the TDM stream from either direction. There can also be more than one tap to retrieve data from the same digital audio channel in the stream. Click here for a more detailed explanation. Click here to see how this is useful. Each digital audio stream is independent of the next, and does not require a common clock. Click here for an explanation from our manual of how to configure word clocks with AudioRail. Each modular unit has two RJ45 connectors and a number of input and/or output channels. Units receiving audio inputs have switches to direct where to route the signal. Units generating audio outputs have switches to select where to get the signals from. Category 5 cable can be obtained from Radio Shack (Catalog #278-1583) for 15 cents a foot, by the foot. Radio Shack's crimp tool (Catalog #279-405) is a professional quality tool that we have found to be as good or better than some other industrial quality brands, and costs $31.99. Radio Shack's 8-pin modular plugs (Catalog #279-406) come in a package of 5 for $3.89. Ready-made 100 foot cable can be obtained from CompUSA, for example, for $30. Another way that this technology can be implemented to accomplish the same or similar result is to apply the technology so that other professional audio products have the essential design embedded within their products, interfacing to the outside world using the RJ45 or other "Ethernet" media connectors. Our vision is for a future where digital audio components don't just continue to replace and displace their analog predecessors, but are also able to be inexpensively interconnected with the same sort of cabling and electromechanical interconnect that is now so widely available for local area networking. We intend to reach that segment of the professional audio industry that would be eager to step up from conventional point to point analog audio snakes, analog building wiring, patch panels and cabling to a means of simply and economically transporting many channels of digital audio over a digital snake using standard off the shelf Category 5 cabling schemes. Both off the shelf Category 5 cable and installed Category 5 cable wiring can be used. Multiple devices can be placed in various locations as needed to pick up and deliver audio from one place to another over, each unit being separated from the next one by as much as 100 meters (or more, using fiber converters), a distance far exceeding the practical length that conventional analog audio cable can be employed, all the while retaining the advantage that noise-free CD-quality digital audio transmission provides. As a functional by-product of the design, there can be multiple devices selected to get audio from the same originating sources. The technology is able to transport industry standard IEC 958 (S/PDIF), as well as Tascam TDIF, Alesis ADAT light-pipe, and other audio related signals, such as SMPTE time code, word clock and MIDI interfaces. Units with these digital audio connections can be directly attached to industry standard digital audio ports on industry products capable of digital audio connections, or can be front ended with any digital to analog and analog to digital converter products of the user's choice to accomplish conventional analog connections. Off-the-shelf digital to analog and analog to digital converters, such as the $230 Behringer ADA8000 (see our analysis) that provides 8 mic/line inputs and 8 line outputs, bring the cost of conversion to/from analog to $14.38 per port. AudioRail products are very user friendly and trivial to set up and operate. The important digital audio sample rates (in the first implementation, 44.1 KHz, 48 KHz, and 96 KHz) are autosensed. The only essential user controls are front panel switches to choose which direction and/or which group of TDM channels to route the individual digital audio streams. There is no software required and nothing else to configure. The logic design for conventional digital audio (AES3/IEC958) transport over 100Base-T Ethernet transceivers was completed, synthesized, and fits in a mating pair of 100K gate FPGAs (Altera EPF20K100ETC144-2, -3). Hardware simulation was completed which simulated the operation of eight adjacent devices routing digital audio signals through with the simulation checking the integrity of the data end to end. Prototype hardware has been designed, built, debugged, and is completely functional. Extensive signal integrity testing with a high-end, 2 GHz bandwidth oscilloscope, logic analyzer, and end-to-end data integrity checks have been performed. Data is transported without error over multiple hops of Category 5e cable of 100 meters or more. Toslink to Toslink plastic optical fiber (POF) links function with margin up to 72 feet (well over 2x the 10 meter maximum spec for POF) at 48K and up to 42 feet at 96K, using the cheapest low end plastic fiber optic cable generally available on the market. The most extensive testing was done with a single 96K digital audio feed that was routed through a group of four adjacent units, each separated by 100 meters or more of cable, then looped back around through the system 16 times using cheap 18 ft. fiber optic cables. In doing so, the digital signal traveled repeatedly through the system, thereby traversing over 10,500 feet of Category 5e cable and over 300 feet of fiber optic cables, before it finally reached its destination, completely error free. A significant feature of Alesis ADAT Lightpipe is that each fiber connection already time division multiplexes eight channels of audio to begin with. A single AudioRail device with four optical Toslink receivers and four optical Toslink drivers can therefore send the equivalent of 32 channels of audio in each direction simultaneously. Because of this format provides the most cost effective implementation, this product has been chosen to be the flagship product. The logic design for transporting four transmit-receive pairs of Alesis ADAT light-pipe connections was coded, synthesized, and fits in a single 100K gate FPGA (Altera EPF20K100ETC144-2). Simulation was completed which successfully transports eight unidirectional streams (four bidirectional pairs) with end to end checking. Prototype hardware was designed, built, debugged and is completely functional. 44.1K and 48K data is transported without error over multiple hops of Category 5e cable of 100 meters or more. Those familiar with the ADAT protocol will appreciate the fact that input streams with up to 60 ns p-p jitter have been successfully tracked entirely in the digital domain without employing any PLLs. Given that the unit interval (UI) time is 81 ns, that corresponds to an eye pattern with only about 25% eye opening. The most extensive testing was done with a single Alesis ADAT 48K digital audio feed that was routed through a daisy chain of six units, the end units being Alesis ADAT units, with four other units in between, spanning three sections of 100M Category 5e cable (over 1000 ft total) and two shorter cables. The Alesis ADAT Lightpipe signal was looped back around using optical cables eight times using cheap 12 ft fiber optic cables. In doing so, the digital signal traveled repeatedly through the system, thereby traversing over 8000 feet of Category 5e cable and 108 feet of fiber optic cables, before it finally reached its destination, completely error free. Prototypes have been deployed successfully and without incident regularly in live sound reinforcement (configuration). Analog front-end interfaces are also in design, as well as interfaces for coaxial S/PDIF, Tascam TDIF, word clock, MIDI, and SMPTE time code interfaces. These were between two adjacent units with a very short Category 5 cable. In non-technical terms, think of the speed of sound as being on the order of 1000 feet per second (roughly). A "microsecond" ("us") is one millionth of a second. If the AudioRail delay were 10 us, then this would correspond to sound traveling roughly one hundredth of a foot, which would be roughly a tenth of an inch. In live sound production, to compensate for this delay, one would only need to move the speakers one tenth of an inch forward from where they would have been if AudioRail had not been employed and straight digital audio cable connections were substituted instead. This is what we mean by "negligible." The first prototypes consisted of a board that accepts eight channels of Toslink optical S/PDIF digital audio, a board that delivers eight channels of Toslink optical S/PDIF digital audio, and a board that has four pairs of Alesis ADAT Lightpipe optical connections. The following are the circuit schematics and screen shots of the PCB artwork, which was done on a 4-layer board (top and bottom signal routing layers, with power and ground inner layers). In the artwork screen shots, the white dots are spaced at a 1 inch grid, to provide perspective of the size. Both the circuit schematics and PCB layout screen shots show the simplicity of the AudioRail design at the board level. All of the AudioRail know-how is really contained in a single chip for each board, which in this case is an Altera FPGA. Schematics of board with 4 ADAT Lightpipe interface pairs. PDF of PCB artwork of board with 4 ADAT Lightpipe interface pairs. High resolution photograph showing inside of assembly. Schematics of board with 8 S/PDIF Toslink receivers. Schematics of board with 8 S/PDIF Toslink transmitters. 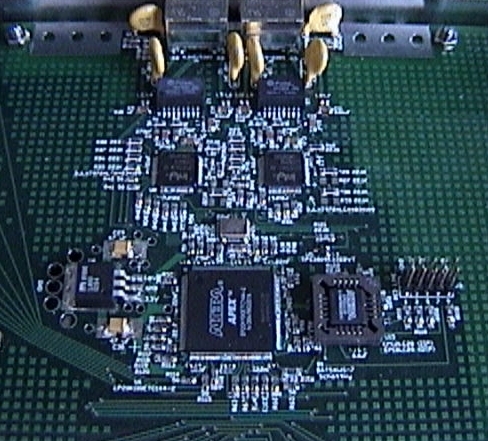 Screen shot of PCB artwork of board with 8 S/PDIF Toslink receivers. Screen shot of PCB artwork of board with 8 S/PDIF Toslink transmitters. 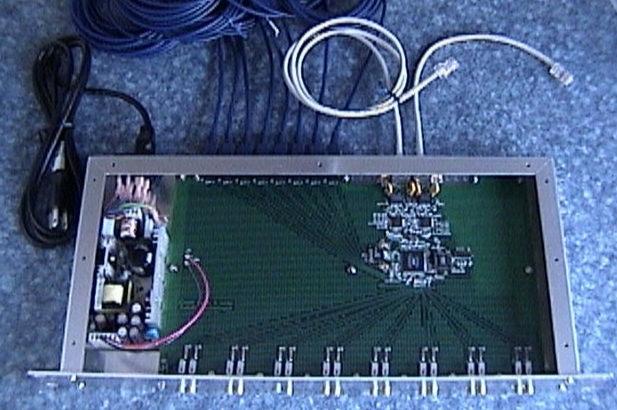 Photograph of S/PDIF board in unpainted enclosure. Photograph of S/PDIF logic components and RJ45 interface. Note 1: The Toslink receiver outputs in the S/PDIF version are now each buffered by a 74LVC1G04, not yet reflected in the schematic or PCB artwork screen shots, for improvement of signal integrity. These are reflected in the ADAT Lightpipe version. Note 2: The S/PDIF versions shown above will probably not be the initial S/PDIF offering. The initial S/PDIF product will likely be a single, exact electrical/mechanical replica of the Alesis ADAT Lightpipe version, coded for S/PDIF. Consequently, it would have 4 Toslink inputs and 4 Toslink outputs. This decision would be for the purpose of keeping development costs down. The following is the bill of materials showing all the parts required to build a mating pair of S/PDIF assembled units (one with 8 Toslink receivers and one with 8 Toslink transmitters), and the bill of materials for the ADAT Lightpipe version, which is one unit with 4 pairs of ADAT lightpipe connections. It is important to point out that this hardware was designed very conservatively, using older, state-of-the-shelf parts, to minimize sourcing risks and ensure a trouble-free path from proof of concept to volume production. There are areas where the cost and number of components can be reduced. Intel offers a fairly new dual 10/100 Ethernet transceiver chip (the LXT973). RJ45 connectors are available with integrated magnetics. Using Altera's more recently introduced Cyclone FPGA family would significantly reduce the cost of the FPGA chips, as compared to the older APEX 20KE family now being employed. Reduction in the number of discrete passive components is also possible. The following is the 3-dimensional mechanical design for the ADAT Lightpipe version enclosure. The flagship product is the ADAT Lightpipe version, as it provides the most cost effective solution for digital audio transport. FCC Part 15 Class B: This is the more stringent FCC emissions standard and qualifies the product for use in a residential environment. E4: Controlled EMC environment (e.g. purpose built broadcasting/recording studios, rural outdoors some distance from railways, transmitters, overhead power lines etc.). It should be noted that some studios might be considered as environment E2. E5: Heavy industrial environment and environments close to broadcast transmitters. EN55013 2001 (emissions): This does not currently apply to our market or current products, as it is a standard to which consumer audio products must comply. We added this additional testing because it cost almost nothing and may be of value if the technology was investigated for being incorporated into an applicable design or consumer audio application. UL6500: This is the UL safety standard to which professional audio products must comply. EN60065: This is the international safety standard to which professional audio products must comply. Posted here are some of the highlights of the extensive testing done to ensure that data is transferred over AudioRail error free. Unless otherwise noted, the optical S/PDIF test configuration was four adjacent AudioRail devices separated by 1000 feet of Category 5e cable that was cut into three sections, with a 96K 24-bit digital audio signal looped around the unit 16 times with cheap 18 ft plastic optical fiber cables. The Alesis ADAT Lightpipe test configuration added an additional pair of end nodes to the above configuration, with the optical signal looped back around the units 8 times with cheap 12 ft plastic optical fiber cables. Audio was generated from a WAV file editor, then recorded at its destination. An FFT was done on each. Clicking on any of the following links will download zip files containing the full resolution Windows Bitmap (BMP) images. Note: FFT comparisons show AudioRail to perform as well or better than just a simple fiber optic cable in its place. For this test, an inexpensive (MSRP $199) PC sound card, the Event EZ8, was used. This sound card uses the standard Alesis Semiconductor AL1401A and AL1402 integrated circuits for encoding and decoding the ADAT Lightpipe protocol. Note: FFT comparisons show the system with AudioRail to perform essentially the same as when AudioRail is removed from the configuration (i.e. ADAT lightpipe cables connecting A/D and D/A conversion boxes directly to digital mixing console). Keep in mind that the noise floor of approximately -80 dB is due to multiple analog components being in the path, which included 1/4" unbalanced "instrument cable" connections. Also compare channels 5/6 with 7/8, which both represent exactly the same mix, in the "Eliminate AudioRail" scenarios, to see the lack of ability to perfectly correlate two different paths/scans that should theoretically be the same. Color graded FFT time vs. frequency scans (not shown) were also taken to search for noise events. None were seen above the existing noise floor. This live sound configuration is currently being employed on a regular basis for a 3 hour gig per week, without incident. (By "without incident" we mean that we have yet to experience a single glitch). Of particular concern in equipment employing digital audio is cumulative and cycle to cycle jitter in the digital audio bitstream. Although each bit may be clocked in correctly with digital accuracy, the point of time when each data bit is clocked in may cause variations in the exact point that each digital sample is reconstructed at its destination. These variations in time can theoretically translate into sonic aberrations. And if jitter is of sufficient magnitude, samples can be dropped due to the inability of the receiving circuitry to track the signal. AudioRail's receiving circuitry re-clocks the incoming signal from the optical receivers, so as to completely remove short term jitter, and has additional mechanisms in place to deal with long term jitter. The FFT plots in the preceding section would show sonic degradation if there was any significant long-term cumulative jitter introduced by AudioRail into the audio spectrum. The optical S/PDIF and Alesis ADAT Lightpipe versions of AudioRail use the fastest Toslink components available from Toshiba, the TORX141 and TOTX141 (see Toshiba product table and product brochure). Components of this speed were only recently introduced by Toshiba and Sharp Microelectronics to meet market demand for high (88.2K/96K) transfer rates associated with DVD and other products. Most professional audio products on the market today still use the slower devices. For optical S/PDIF, the devices consume all of the 0.25 UI margin (at the specified maximum 10 meter POF length), leaving none for the designs which employ them. Consequently, no product on the market today can claim conformance to the specification, on paper. Fortunately, testing has shown that the Toslink devices in practice operate far better than specified. This, combined with good high-speed digital design techniques that were employed in the AudioRail products have yielded plenty of margin. Although Alesis has not specified a jitter value corresponding to their ADAT Lightpipe specification, they have cited the older Toshiba and Sharp optical components, which are rated at half the speed as those being employed in AudioRail. The following screen shots were taken with a 2 GHz bandwidth Tektronix TDS794D digitizing oscilloscope of a mating Toslink pair of devices with various lengths and quality of optical cable between them. The stimulus was a 25 MHz clock source, rather than a digital audio stream. The jitter screen shots show the transitions one cycle after the transition (rising OR falling) that triggered the sweep. The persistence is infinite, color graded over approximately 10 million sweeps for 1 minute. Horizontal scale is 1 ns per division. Vertical scale is 0.5V per division. 0V reference is one division from the bottom (arrow on left side). Trigger voltage is 1.5 V (arrow on right side). Signals are LVTTL (low threshold 0.8V, high threshold 2.0V). Signal driven from Rx Toslink (at trigger). Rx Toslink jitter with ILS200 Monster Cable (1 meter). Rx Toslink jitter with ILS100 Monster Cable (1 meter). Rx Toslink jitter with un-named 2 meter cable from Circuit City. Rx Toslink jitter with Steren 260-012 (4 meter, $6). Rx Toslink jitter with NXG brand NX-706 (6 meter, $14). Rx Toslink jitter with two 4m cables plus Radio Shack #M5-1583 coupler. Note: All oscilloscope screen shots that follow (dated 1/22/2003 and later) are with a 1 GHz bandwidth Tektronix TDS784D digitizing oscilloscope. The following screen shot shows AudioRail receiving looped back 96K digital audio data that has traversed 42 feet of the cheap fiber optic cable (33 feet is the Toslink design limit), including 3 cheap Radio Shack (#M5-1583) mechanical Toslink couplers, with one cable not inserted into its coupler all the way. The cursors show the 20.3 ns jitter spec. that has been exceeded (dark blue dots outside of that zone). It also traversed the grand journey 16 times through AudioRail with maximum length (100 m) Cat 5 cables. The source was a 48KHz square wave for 1 minute. The result at the other end was recorded as a text file, so that the entire waveform could be searched for any bad samples. There were none. Rx Toslink jitter at 96K with 42 feet of cable. The following screen shot shows AudioRail receiving looped back 48K digital audio data that has traversed 72 feet of the cheap fiber optic cable (33 feet is the Toslink design limit), including 3 cheap Radio Shack (#M5-1583) mechanical Toslink couplers, with one cable not inserted into its coupler all the way. The cursors show the 40.7 ns jitter spec. that has been exceeded (dark blue dots outside of that zone). It also traversed the grand journey 16 times through AudioRail with maximum length (100 m) Cat 5e cables. The source was a 24KHz square wave for 1 minute. The result at the other end was recorded as a text file, so that the entire waveform could be searched for any bad samples. There were none. Rx Toslink jitter at 48K with 72 feet of cable. The following screen shot shows AudioRail receiving 48K Alesis ADAT Lightpipe data that has traversed 48 feet of cheap fiber optic cable (33 feet is the Toslink design limit), including 3 cheap Radio Shack (#15-1583) mechanical Toslink couplers. This puts it just at the threshold of error. The cursors show 61 ns of peak to peak jitter, out of a unit interval time of only 81.38 ns, which yields an eye closure value of 75% (eye opening of only 20 ns). It also traversed the grand journey 8 times through six AudioRail nodes with a total of over a 1000 feet of Cat 5e cables. The sources were 4 stereo channels of different varying square wave patterns, all running for 1 minute, that were optimized by trial and error to yield the maximum jitter that they could. The result at the other end was recorded as a group of 4 text files, so that the entire waveform could be searched for any bad samples. There was one. Note: The threshold was intentionally pushed to the point of error for illustrative purposes. It is not a statistical function of cable length. If the fiber optic cable length and couplers are reduced slightly, the error rate goes completely to zero. Rx Toslink jitter, 48K square waves with 48 feet of cable. The following screen shots show AudioRail receiving 48K Alesis ADAT Lightpipe data consisting of four stereo pairs of sine waves, at frequencies 27.5 Hz, 55 Hz, 110 Hz, and 220 Hz, for a total of one minute. The same AudioRail test configuration is used as in the previous example. Since the source material consists of low frequency sine waves, FFT scans, rather than "WAV textfiles" are performed to validate data. Any bad bits show up as single sample anomalies that are easily spotted in an FFT scan that covers frequencies on a linear vertical scale up to the Nyquist limit of 24 KHz. In this example, the jitter is 60 ns, and there is one error occurring in each channel. The error is shown to illustrate the relative sensitivity of the accompanying FFT scans. The FFT scans were done using Blackmann-Harris windowing of 8192 sample buckets, with color graded intensity on the vertical scale (frequency) of linear values plotted 5000% of full scale. Rx Toslink jitter, 48K sine waves with 48 feet of cable. Similarly, the following screen shots show AudioRail receiving 44.1K Alesis ADAT Lightpipe data. The jitter is 65 ns p-p, and there are no errors. Rx Toslink jitter, 44.1K sine waves with 48 feet of cable. Note: We do NOT recommend using long fiber optic cable lengths with Alesis ADAT Lightpipe connections. (Neither does Alesis.) The jitter in products using ADAT Lightpipe is many times the magnitude of conventional optical S/PDIF connections, and long cables aggravate it. This is not fundamentally the fault of either Alesis or other vendors employing the ADAT Lightpipe interface. It is due to the greater variability in data patterns in the protocol, as compared to that using optical S/PDIF. We recommend keeping cable lengths for Alesis ADAT Lightpipe connections short, and using good quality cable. The higher jitter in Alesis ADAT Lightpipe should also not be considered a threat to audio fidelity for several reasons. First, the jitter is due to duty cycle distortion that contributes frequency components that are not less than about 1 MHz. Also, the mechanisms employed to recover the signals use PLLs (or the digital equivalent of PLLs) that have loop time constants that are orders of magnitude less, effectively filtering that jitter out. In the AudioRail implementation, synchronization to the signal being decoded occurs only once per frame (i.e. at the sample rate). And the data re-encoded at the far end knows nothing even of this jitter component, because it is absorbed in elasticity buffering along the way. The issue, then, is whether the data can be accurately tracked without mis-clocking a bit in (i.e. altering a bit). Artifacts of this sort, when they do appear, surface as harsh static and crackling noise, rather than subtle sonic variations, and are very easy to spot. We have observed varying results with different vendors' ADAT Lightpipe equipped devices with respect to jitter tolerance. AudioRail has been tested at 96K, 48K, and 44.1K rates with a host of consumer and professional audio products on hand, including sound cards, digital audio converters, and discrete standalone digital audio components. The DC (3.3 Volt) current draw of the receive S/PDIF version is 0.46 A, the transmit S/PDIF version is 0.64 A, and the ADAT version is 0.63 A. The AC/DC switching power supply inside the S/PDIF unit is capable of delivering 10.7 A maximum, and 8.0 A continuous current. With this margin, things are barely getting warm inside the box. A smaller power supply was chosen for the ADAT Lightpipe version, bringing it down to a rating of 5.0 A maximum continuous current. It is still barely getting warm. Successful compilations of the Altera FPGA for each of the units that contains the AudioRail logic design have been yielding maximum clock rates of around 65-70 MHz for for the FPGA used in the 50 MHz receive design and 108-113 MHz for the FPGA used in the 100 MHz S/PDIF transmit design and Alesis ADAT design. Signal integrity checks with a 2 GHz bandwidth oscilloscope showed about 0.3V 0.3V overshoot/undershoot on the FPGA to Toslink connection (see the Signals driving Tx Toslink. screen shot above), which is not high enough to activate the rail clamping diodes inside the semiconductor devices, and all other signals are better than that, most of which have no overshoot or undershoot at all. All clock signals have monotonic rising and falling edges, and there are no setup/hold violations on paper or observed in the lab. 100 MHz clock screen shot. Note from the schematics and PCB etch screen shot that all signals are series terminated at the source. The logic design consists entirely of Mealy/Moore sequential state machines and logic with no additional combinatorial logic, and was written in VHDL. All asynchronous and isochronous inputs are front-ended with synchronizers. A substantial amount of time was spent pulling out and plugging back in fiber and Category 5 cables, flipping switches, and power cycling units live to make sure that the AudioRail components do not lock up. In all cases, normal operation is restored in less than 2 seconds from the point that the connections or power are restored. If the fiber Toslink connections are pulled out or inserted slowly enough (deliberately much slower than they ever would in actual practice), there is a point at which the digital audio stream will waver between losing and regaining synchronization so as to cause serious and sustained noise in the analog realm. Other than that, the system's audible response to live insertion and removal of connections and power cycling events is similar to what one would expect in traditional analog sound systems when they are power cycled live or have cables inserted or pulled live: A single audible click, pop, or crackle noise.